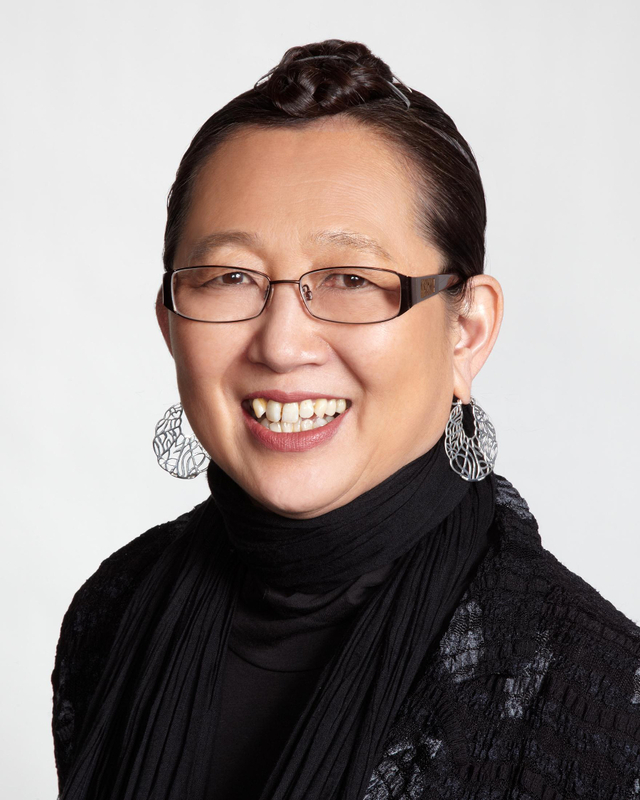 To the industry, Hitomi Gilliam AIFD is inspirational, an innovator and mentor to a significant number of people. 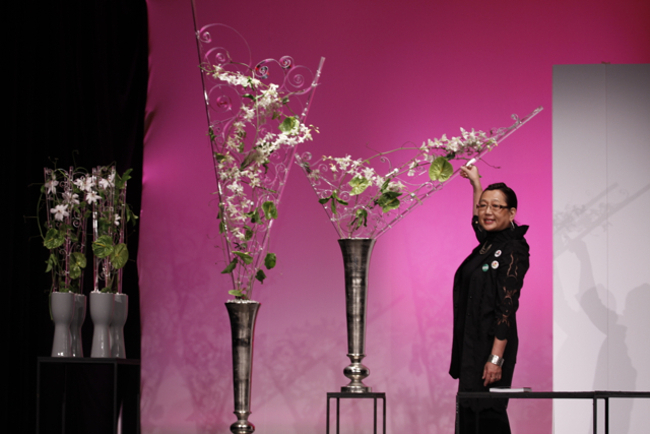 Through her strive to push designers and the industry to their limits, Hitomi has set the bar of what many designers hope to be and what they will have to be for a strong future for the floral industry. 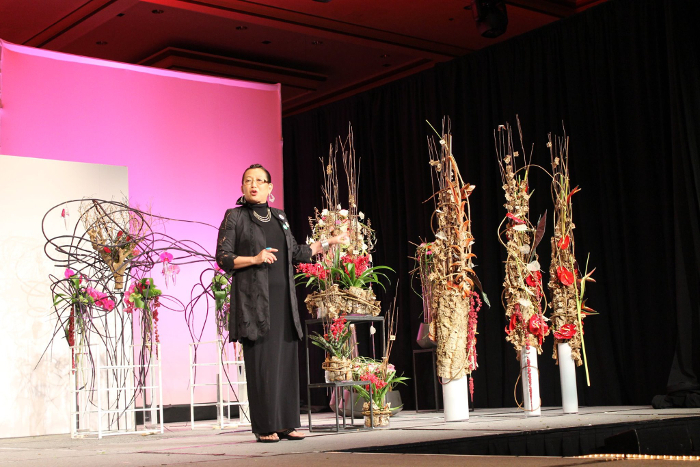 Hitomi is the owner of DESIGN358 where the company started out as an event-oriented company and evolved into a leader in floral education. Other than the workshops and industry educational programs that DESIGN358 provides, it also has developed the European Master Certification program (EMC). Surprising to us all, Hitomi even has some hobbies and interests when not jet setting all over the world and here is what she had to say on that particular topic. H.) I started in the greenhouse business. I worked for a greenhouse in propagation. Then moved to a job at the nursery working in propagation. Then started a small growing operation at home – bedding plants, hanging baskets along with eggs and produce like good Hippies did living out in the country in the 70’s. Built a small greenhouse operation – on purchased acreage – built all buildings ourselves (my ex and I). Opened a Plant Shop in 1977, turned into a Flower Shop in the following 2 years. 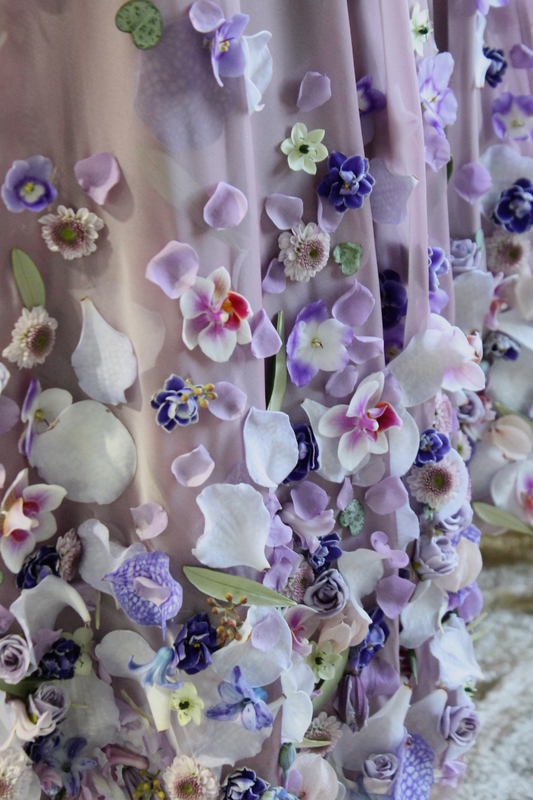 How instrumental were your first floral experiences to the many years of your success so far? H.) My first memorable floral design experience was taking a short lesson from a retired florist neighbor – they showed me how to do wedding bouquets, corsages and boutonnieres. Customers had been asking me to do weddings… my friends told me to take on a small one – they told me that they can show me how to design wedding flowers. I was hooked!!! Learning new ideas and techniques was so very exciting to me. Making things, I knew, had to be part of my career. Just growing flowers and plants just was not enough… I needed creativity on a daily basis in my career!! 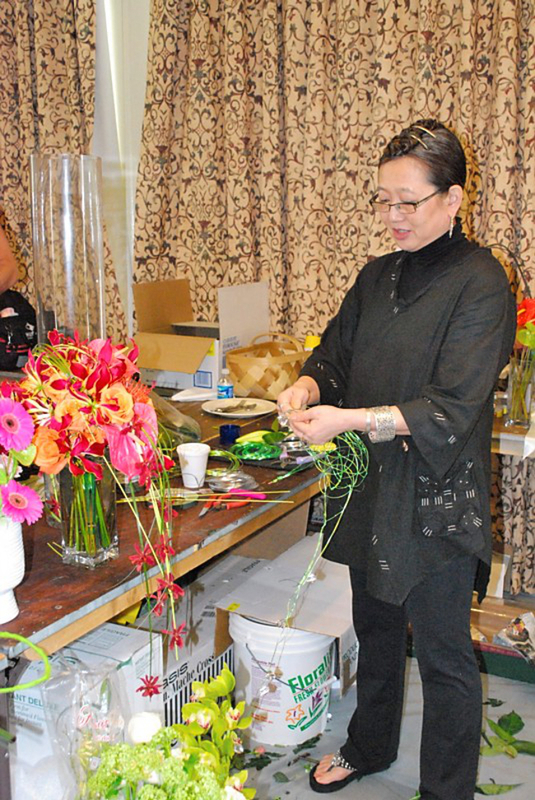 What are some of the struggles that you have had to face on your road to success and becoming world renowned for floral education and design? Of all your achievements to date what are some of the most memorable or exciting? H.) 1) My first AIFD program, the year after I was inducted in 1987 ‘Jewels of the North’ – first time on AIFD stage was truly memorable, very scary. 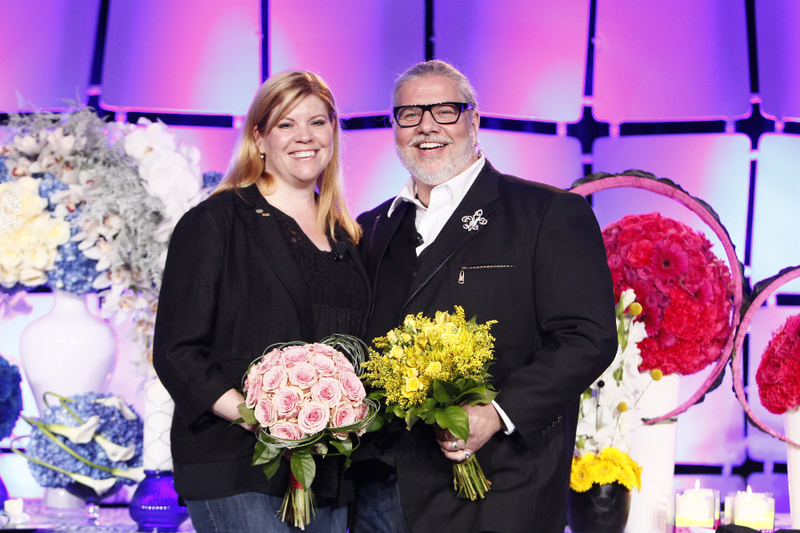 2) Winning the Great American Floral Competition Finals at AFS Convention in Las Vegas – the biggest floral convention of our time – 4000 in attendance. 3) Publishing the first book with my co-author, John Haines AIFD, EARTH MAN SPIRIT – it is still by far, my most favorite book. 5) Winning the ‘Best of Show’ Gold Award for my design entry in the international floral professional category at the Singapore Garden Festival. Give us a quick rundown of the European Master Certification program and some of the advantages for a designer’s future. H.) EMC is the most comprehensive European design education possible without taking weeks/months to actually go to Europe to a full-time school. Tomas De Bruyne and I have collaborated to formulate this stream of accelerated study to enable those who are looking to add European Design to their repertoire by scheduling it in a way that is doable for everyone. The study is split into 3 parts over one year period. EMC Part I FOUNDATION is staged in various locations – workshop comes to you so that travel is not outside of the country. This segment is fundamental theories and techniques – the basis for European study. EMC Part II SELF PRACTICUM allows for practicing everything learned in Part I, to absorb it, to internalize it. Through scheduled assignments to turn in – designs to post on EMC Facebook page for assessment, keeps the learning continuous, but in the comfort of your own work space – to keep the cost down on the practice portion of this curriculum. Nomenclature study is also a big part of Part II. We feel that unless you keep up on your learning by practicing on daily basis, you can lose it. EMC Part III ADVANCED is the finale to this program – staged in Bruges, Belgium, one year later from the start of the program. We feel that this allows the study material to be completely absorbed by the students, knowledge of nomenclature – internalized, the techniques – well practiced, theories – total understanding, this we feel is the best feature of EMC. After completing 5 days of Part III, on the 6th day – a full day of oral, practical and written examination is administered to test the knowledge and skills. EMC certificate is presented to those who pass every phase of the exam with required scores. Sorry, that’s as quick an explanation as I can come up with. H.) My philosophy to designing parallels Eastern studies – Ikebana thinking. Nature is supreme!! All inspirations one way or other is nature-oriented. Nature is Truth. Man makes up all the Rules…which by the way may not always be TRUE. Right and Wrong is a man’s concept – a very subjective judgement. I prefer to live by the Law of Nature – it is always TRUE. I base all my designing on concepts which occur in nature. Even if I am presenting a concept which is contrary to nature… it is based on ‘what is’, and ‘what is not’ by nature. I have devised a system that is called 3 Layer method which applies to all designs, not just floral, but applies to everything. It is based on the 3 components of Ikebana – Heaven, Man, Earth – our world is based upon it – these fill the world, the universe… Likewise, because we create a little microcosm of the world within our design, it must have the similar representation of the same. This makes the design more truthful to nature. My Japanese background allows me to see the world, natural world in a very wholistic way – approaching composition from various perspectives instead of a singular spot and point of view in time. How important do you find setting goals and what are some of the goals you are working towards right now? H.) Setting goals is important to fulfilling your life’s purpose. However small or big the goal is, it guides you to attaining that new level. Without goals, one can wander and squander a lot of precious time in the scheme of life. It feels good to reach certain pinnacles in your life – these are the things of personal satisfaction, accomplishments and builds confidence and self-esteem to reach new heights. It perpetuates ‘wellness’. I have always set short term goals – breaking down the steps to the big goal. And my bigger goal has always followed a 10 year scheme. 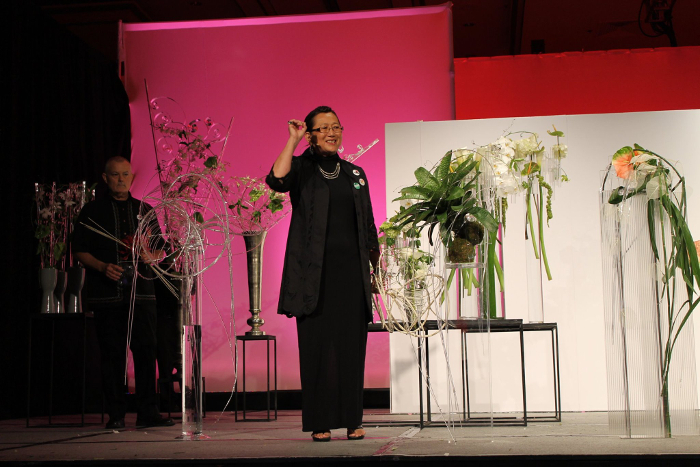 The current 10 year goal is to strengthen the creative, educated, brilliant talents and reputation of ‘FLORAL PROFESSIONALS’. 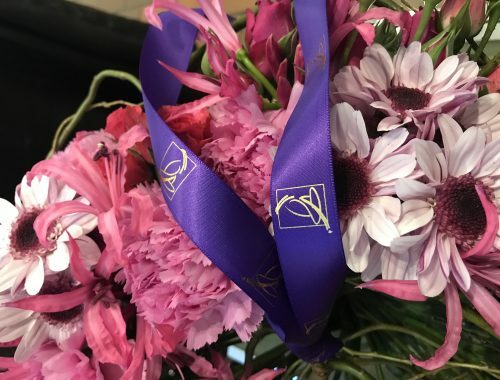 To empower the high-end floristry, to separate this layer from the lower feeders – to bring the level of expertise and skills of this profession, to be respected and be reckoned with. To push for higher pay for talented and skilled designers. 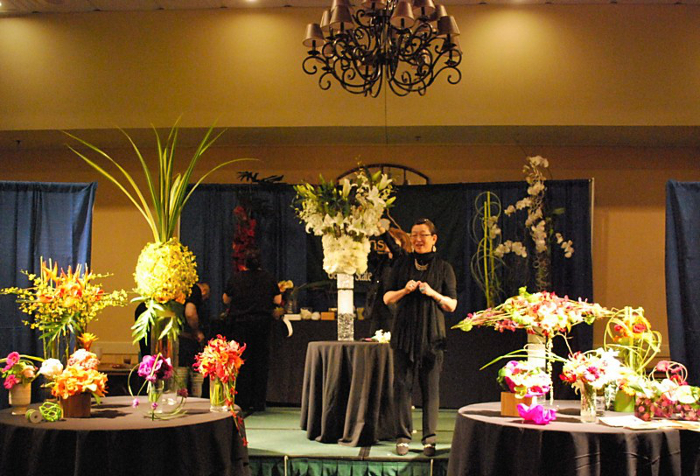 That the consumers will see that difference when dealing with floral professionals. Working on steps to get there… Want to preserve the profession that I have chose for the lifetime. What advice would you give to those looking to start taking steps toward teaching industry classes and industry speaking? H.) To join the community of educators, to stay in touch with all others pursuing this profession. Continually upgrading your knowledge. You can teach only if you are continually learning – otherwise, it’s a dead-end street – you are not contributing to the ever-changing world of design. I would personally love to put together a fellowship of serious educators, seasoned and new and upcoming. The group will not see any age divisions on methods of teaching – all open forum on teaching and presenting for the wellness of the industry. To take the ‘SELF’ out of teaching and speaking, for the benefit of ‘ALL’ who want to learn to elevate the profession. Are there any exciting projects or shows we should be looking forward to for the rest of the year and in 2015? H.) I see the floral industry split into a more defined Low End and High End. The smart, skilled and talented will push themselves up to cater to the High End and will have extremely successful business. For all those who do not move up into that layer, their business will be a super grind, competitive pricing, volume-oriented business where rewards for quantity vs. quality design and style skillfully created. This layer with thin out for florists as they continue to battle it out with the box stores and ever growing DIY sector. More focus on events and wedding work will help increase the high end business. 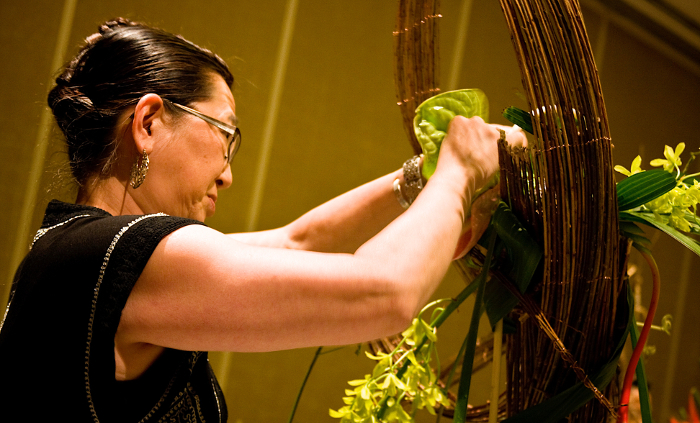 I expect the new generation of floral professionals will lean more to the Event Business – there’s money to be made there if Creativity is kept in balance with Good Business. H.) The eyes which pick up inspirations – must be open. Open eyes, open mind… is the mantra behind how much inspirations cross your paths. Inspirations are everywhere, available every minute of the day if you are open to it. My greatest inspiration comes from Nature, no doubt. But my secondary inspiration comes from modern art – paintings, sculptures, textile, …. My current influences of the last 5-10 years have come from Architecture (structure/construction) and Fashion (decorative form/texture/colors). Who are a few of the people that have helped inspire you or guide you along your career? 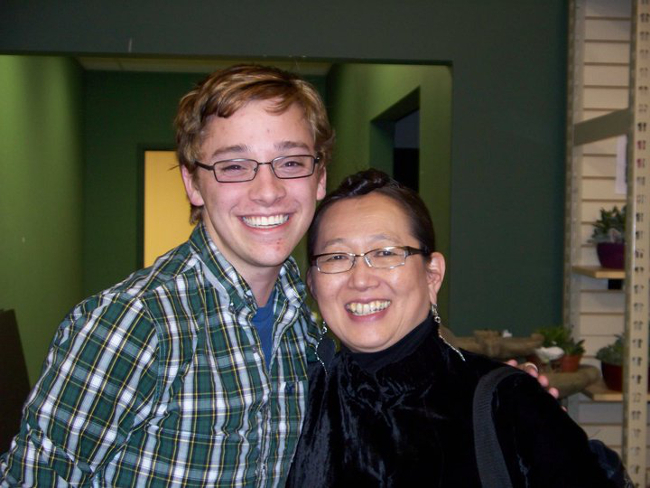 H.) My earliest inspiration whom I followed diligently was Cort Schwanebeck – his work exemplified clarity, pure!!! I love that word ‘PURE’ it describes on the mark emotion!!! I was wowed by the collection of designers who competed in the World Cup in Detroit back in the mid 80’s. 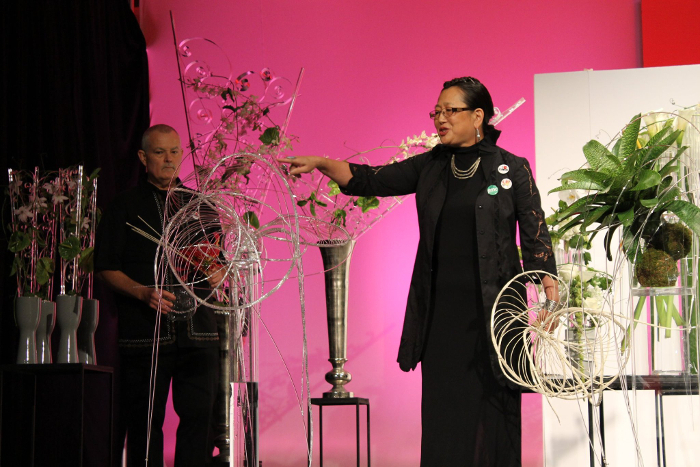 My first time seeing the scope of floral design on the international level – it changed my world!!! Klaus Wagener won the competition. Daniel Ost was close behind…. can you imagine that!!! I was lucky to connect with the ‘VISION’ of these incredible talents when I was just starting out. I competed with John Haines AIFD – a man and a talent I admire and truly relate to. We worked together for many years – sharing thoughts, opinions, visions…. such a valuable time in my career!! I am grateful to have a very similar working relationship with Tomas De Bruyne currently – a brilliant man who pushes his boundary on the daily basis creatively, but has his sight always in balance with business. I can learn a lot more from this man. I love Gregor Lersch and his powerful curriculum of passion and hard work. I love Per Benjamin for his brilliant color works, masterful and energetic – his teaching skills are amazing, highly organized and structured masterfully. I think what has helped me grow even more than just within the industry – to stay more holistic in approach to my own course of study is: My constant search for parallel arts. Architecture – study of structure/construction is so valuable in armature work and pure mechanics. I have thoroughly studied the works of Frank Gehry and Santiago Calatrava for instance. I have been a huge fan of Georgia O’Keeffe all my life – have been on an annual pilgrimage to her New Mexico Museum for the last 30+ years. Her study of nature is the Ultimate Truth!! I have drawn much inspiration from Fashion – Vivian Westwood and Alexander McQueen has been thoroughly studied and their influences. No lack of inspirations, don’t you think?? What are a few of your favorite fresh and hardgoods to work with right now? 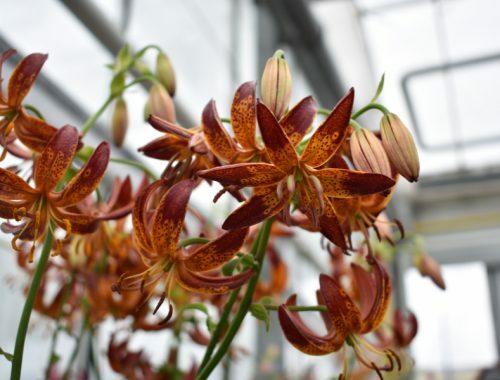 H.) GLORIOSA LILIES – just want to be a gloriosa when I grow up!! Ever so vibrant, sassy, free-spirited, not afraid of who she is… Other materials have inspired me – so many to list, but Gloriosa has stuck with me with its inspiration for 15+ years. I have been designing with Gloriosas that long… As far as hardgoods…. Of course, I have made a study of what to do with Midollino, this experiment spanning over 5 years. I love Flat Cane and Flat Wire. I am going through a revival with Lucite, Extruded Acrylic for Transparent Designs!! If you could meet any person in history, whom would you meet and what would you discuss? H.) I would like to sit down with Isamu Noguchi, the Japanese-American sculptor/artist/land artist. I am so intrigued with many artists from that era, including Georgia O’Keeffe, Constantin Brancusi, etc. Noguchi apprenticed under Brancusi in his early days. 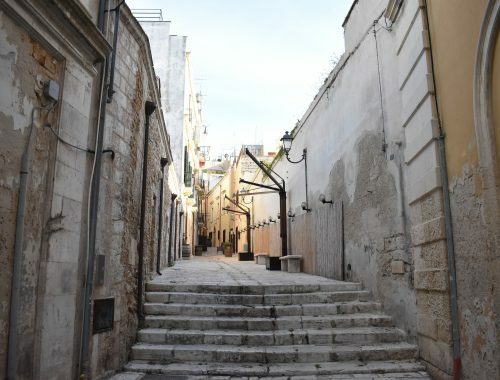 Because of his mixed heritage, he was often confused with his identity – and travelled a lot, searching… to find himself. His best sculpture clearly shows his mixed heritage – showing the raw stone/ what it was before it became sculpted. The raw stone exposed tells the real story of the process – which ultimately is the art, not the final finish. Gehry also felt that way about the process – as art. I believe in this as well. Actually I would like to be in a round table discussion with all my heros – Noguchi, O’Keeffe and Gehry. I have a list of questions a mile long about their vision and their purpose, and what the result should evoke. Floral.today wants to thank Hitomi from the bottoms of our hearts for taking the time to share some insight into her mind and life. 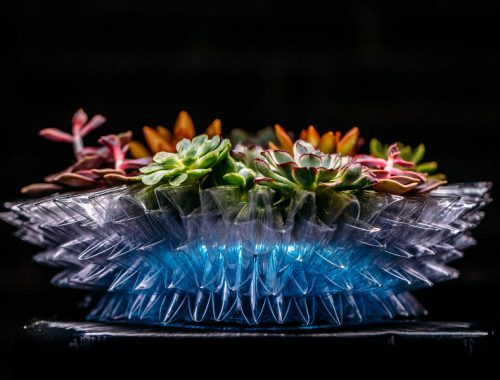 As a shining light of education, creativity and innovation for the floral industry, we always look forward to what Hitomi is going to do next. 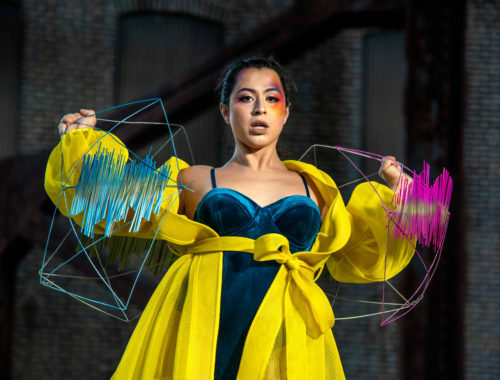 As one of the most trend setting designers in the industry, Hitomi has evolved many products in the industry but the most recent product to evolve design would have to be her work with midollino and her midollino spiral. Make sure to catch our #FloralFriday article on Hitomi’s technical video on how to make the spiral and our attempt at making the ever popular midollino spiral.